It's day four of the 31 Day Challenge, and today's theme is green nails! 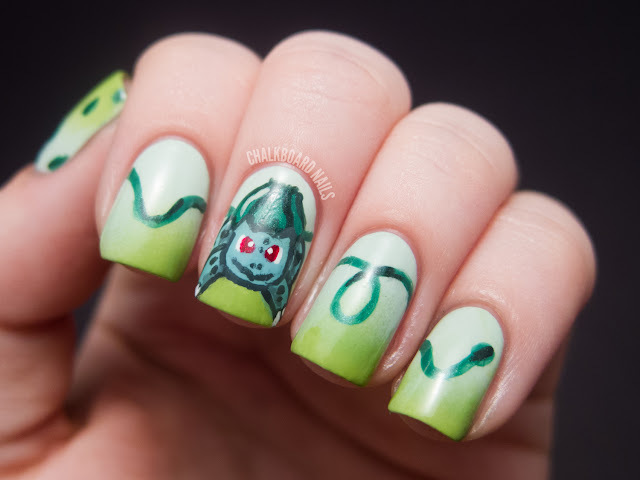 I was brainstorming what I wanted to do for these nails with my boyfriend, and eventually I was just like "I'm gonna do Bulbasaur." I got up and started walking over to my nail station and he said, "What, now?" YUP! I started them right then. I was too excited not to. Bulbasaur is probably in my top 3 Pokemon, which is a pretty prestigious list to be on. I've been playing Pokemon since I was a kid (on my green Game Boy Color) and still play it now (on my pink DS). This design was challenging -- especially since it was done in only polish. It took a lot of time and patience to complete it, but I couldn't be happier with the representation. 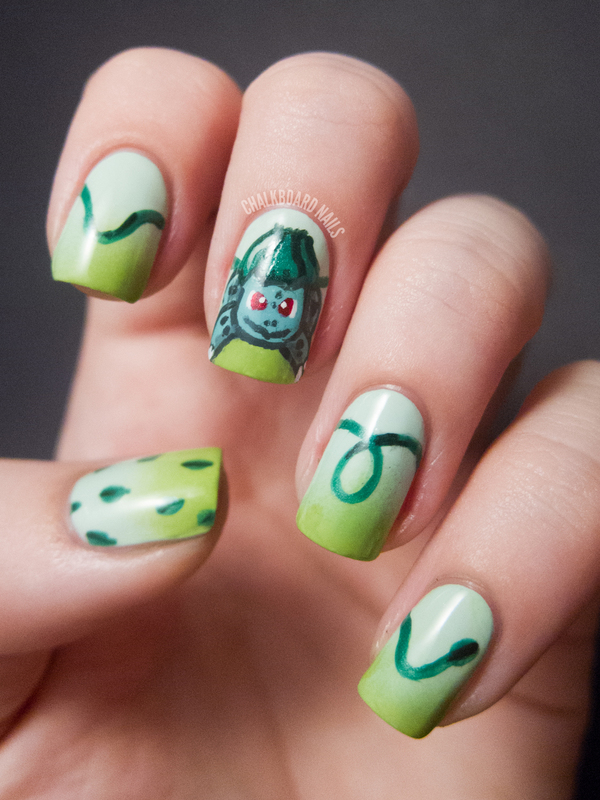 As you can see, I've depicted sweet little Bulbasaur doing a spirited Vine Whip and have connected the vines between my nails. The base gradient here was made using China Glaze Re-fresh Mint and LCN Fanappleistic. 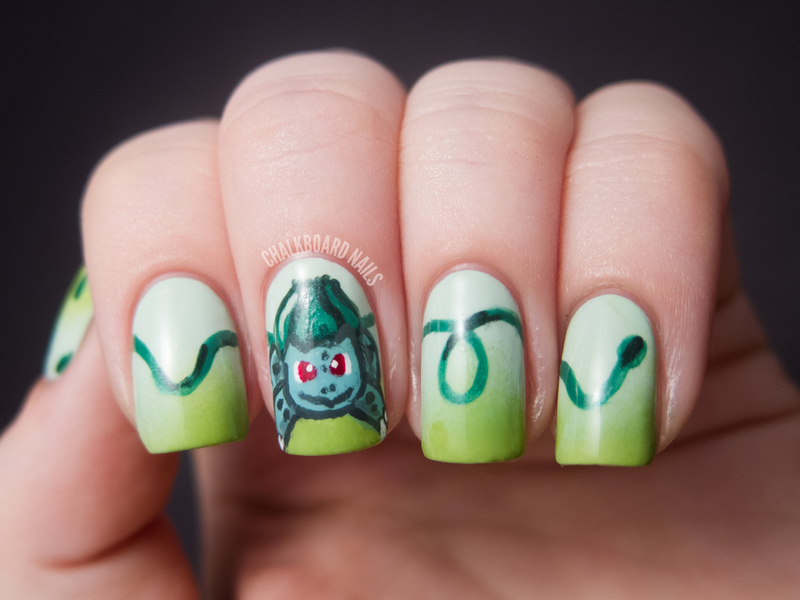 The bulb and vines were done with Sally Hansen Going Green and his body was made with China Glaze For Audrey. The eyes are OPI Danke-shiny Red. Any other shades in the manicure were used by mixing in white or black with the aforementioned colors. On my thumb, I did a depiction of Razor Leaf. All of the nail art on this set was freehanded using my favorite medium length striper. It was definitely difficult at times and I had to go back and do a couple of corrective measures to keep Bulbasaur looking normal. A few times I had to manipulate his eyes to make him look less cross-eyed. Working on such a tiny canvas has its challenges! Do you guys have a favorite Pokemon? If you'd like, you can check out last year's day 04, but it definitely is not as exciting as this! Stay tuned for tomorrow's blue nails, which I am so eager to show you! I love Pokemon! I have also been playing it since I got my Gameboy Colour (Pokemon Yellow) as a kid. I now play it on my DS. It's hard to pick a favourite, but probably Gyrados or Ponyta. LOVE it!! And I do Have a favorite pokemon! Shinx! From Gen 4, love him! SO awesome! But out of the original 3 starter Pokemon, I'd have to go with Charmander. Oh...my...goodness. I LOVE this! Ahh Pokemon...I remember that from back in the day! Although my husband and I have been known to break out into spontaneous renditions of the theme song while making dinner: "I wanna be the very best, like no one ever was!!" Best nails ever! And I was just using razor leaf (with Meganium) this morning! Favorite Pokemon is probably Lugia... is it cheating if it's a legendary? My favourite is Absol. I'm also in love with Woobat, one of the newest Pokémon. 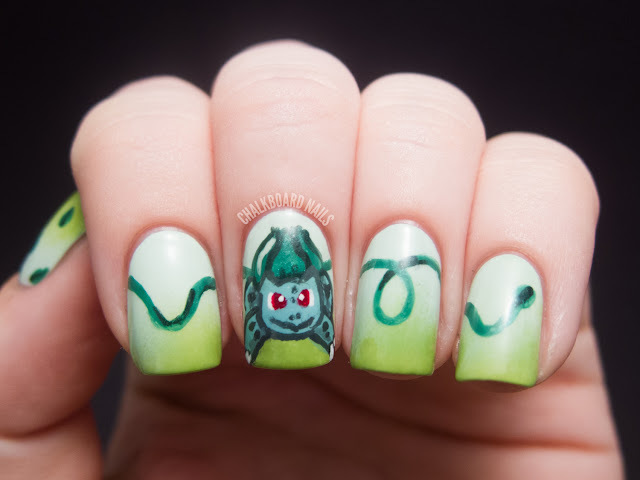 I've already done Bulbasaur on my nails, but it didn't turn as cute as yours ! Wow! this is amazing! Pokemon is awesome! and my favorite is Zapdos! This looks incredible! 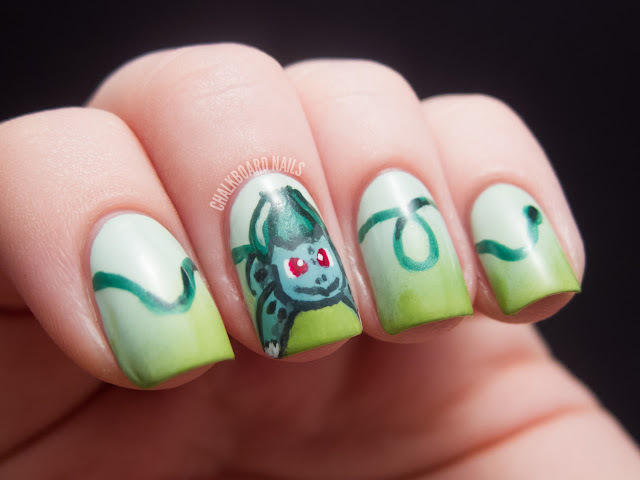 My favorite pokemon is definitely Vaporeon but I doubt that would translate well on nails! This are so super cute! I'm glad to see so many other Pokemon fans! My favorite pokemon was always Eevee. Aww this is adorable! Jiggly Puff was always a favorite for me. This looks awesome!! 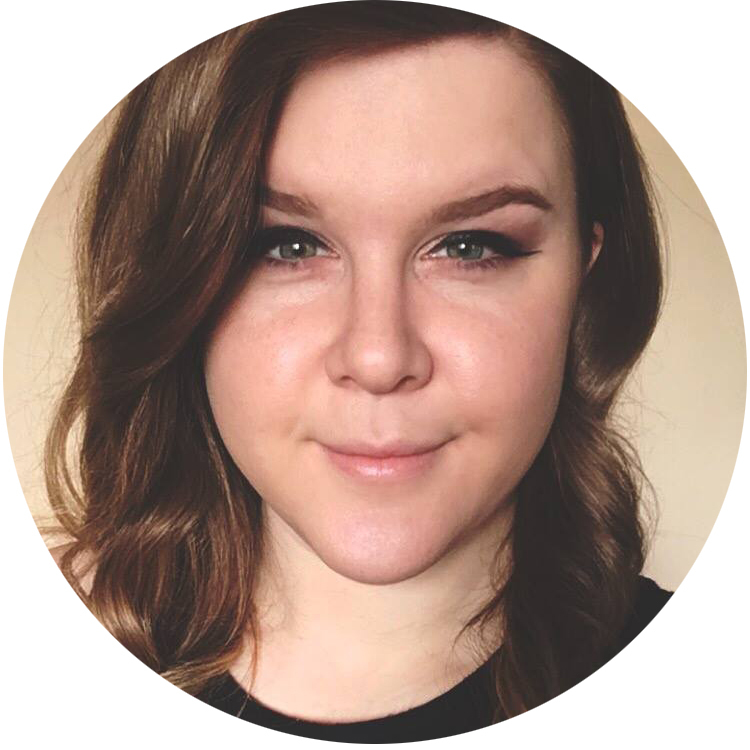 I actually have to keep this page hand to show my fiance - he will get a kick out of it! You did a wonderful job and your thumb nail is adorable!! I'm totally loving this. You are very talented. Bulbasaur is so cute. Meowth is my #1 Pokemon.. Love the nails.. You did an amazing job! Ok, not that you haven't heard it enough, but this is AMAZING!! You did an excellent representation- you have so much talent it's kinda ridiculous- awesome nail art. 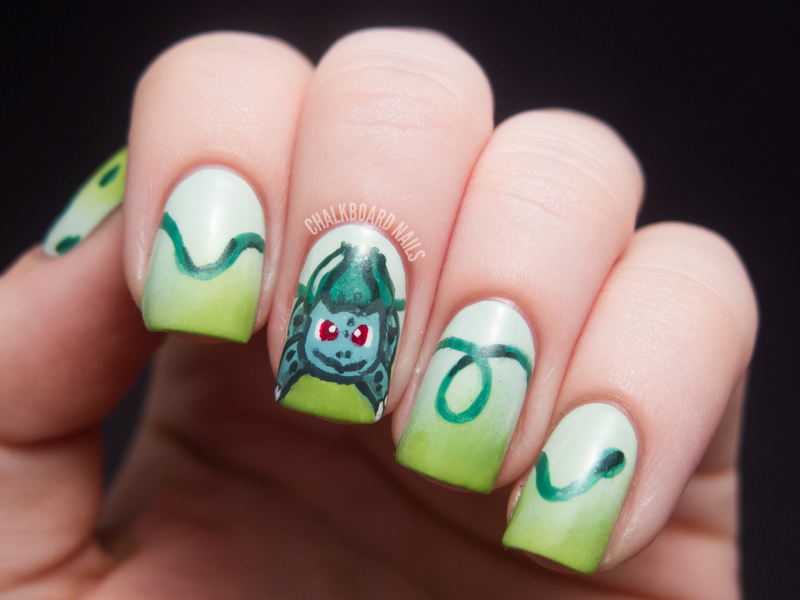 I'm sorry I have no Pokemon frame of reference, but I still think the mani is super cute. That design looks so cool! Love it! Awesome :) Pokemon always = win. I had a green Game Boy Color too! But I have a black DS, not a cool pink one like you. These are adorable! I love Bulbasaur too =) I think my favourite is probably Dragonair. wow you did such an awesome job! Eeeeee! 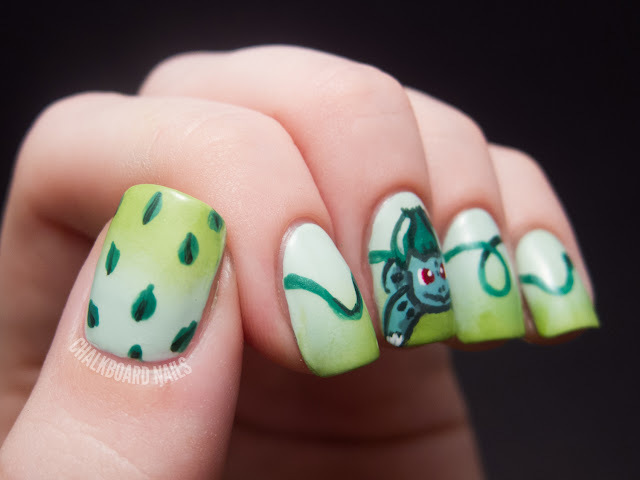 My favourite is Vaporeon.. now I have to see if I can draw one on my nails :D This is so cute! Hahahha this is awesome! I love Pokemon! OMG, best nails EVER :p i really love them ! This is so cute though!!! Nails with Pokemon on can never be wrong! Great job! I can't really play favorites...but...Bulbasaur family tree, Mew, Haunter, Rayquaza, and Blaziken are some top choices.